23 Sandy Gallery is pleased to announce our BUILT award winners. This very smart exhibition is still on view in the gallery, so stop by soon to see the show if you happen to be in Portland. BUILT is an international juried exhibition of book and paper art examining the relationship between contemporary book art practices and architecture, engineering, landscape and construction as form, function and structure. Book artists took this opportunity to re-imagine the ways we as designers, of either books or buildings can inhabit and shape the world around us. Our disciplines have a natural synergy. After all, books and buildings are both kinetic, sequential, structural and time based. BUILT examines the relationship between the built and the book. Shown above, this book has been a gallery visitor favorite! 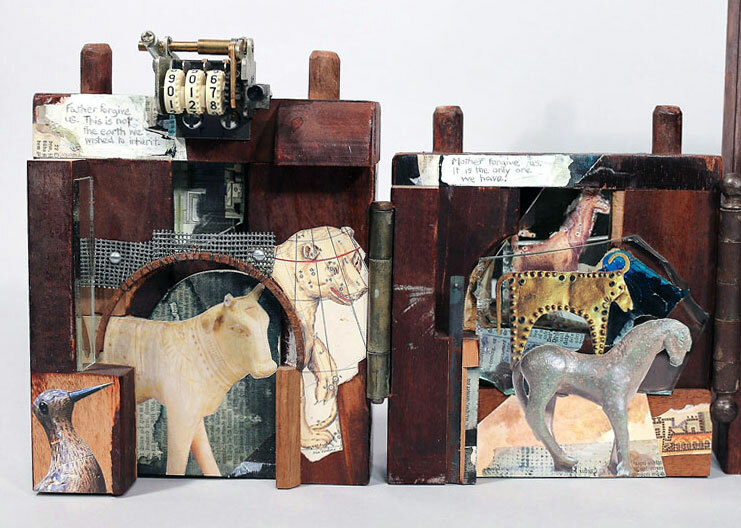 Created using reclaimed building materials and furniture scraps, this book is very “built.” Over many years of creating sought after books, Sue Collard has mastered working with unusual materials, creating unique books with thoughtful, studied narrative as cohesive sculptural works. Click here to see more photos of this stunning work. Congratulations to the following artists selected by Sandra Kroupa, curator of the artist book collection at the University of Washington. These books will be purchased by 23 Sandy gallery and donated to the library. Congratulations to all of our BUILT award winners and to every talented artist who participated in this stellar exhibition. Selecting these awards was difficult in a show filled with so many superb works. Click here to see all the works in BUILT.